What's not to enjoy about the newest dwarf buddleia! The Pugster® Blue Buddleia is part of a new Dwarf Butterfly Bush Collection. While we appreciate the compact 2 foot tall and wide size, the blooms are the size of a regular size butterfly bush. Not only are they full size blooms, they are the thickest and fullest we have seen. The blue flowers have tiny yellow to orange eyes in the center. You will find the Pugster series offers a much improved hardiness and winter survival over other dwarf butterfly bush varieties. Fragrant flowers open up on this small flowering shrub in early summer and continue on to early fall. 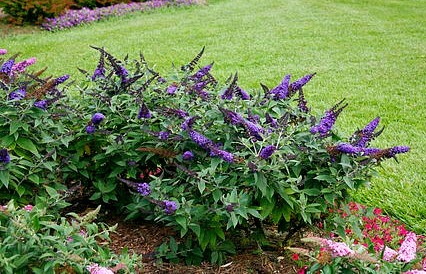 As nature produces so few actual blue flowering plants, this butterfly bush will take a prime space in any garden or landscape setting. Order the complete Pugster Group with the Amethyst Butterfly Bush and the Periwinkle Butterfly Bush. Pugster Blue Buddleia is grown in a quart size pot. Will begin shipping the latter part of June.